Millennium Recycling What Types of Paper Go in the Bin? What Types of Paper Go in the Bin? Did you know that recycling 1 ton of paper saves 17 trees, 7,000 gallons of water and 463 gallons of oil? To make sure you are adding to those numbers and not hurting them, learn what you can and can’t put in the bin. 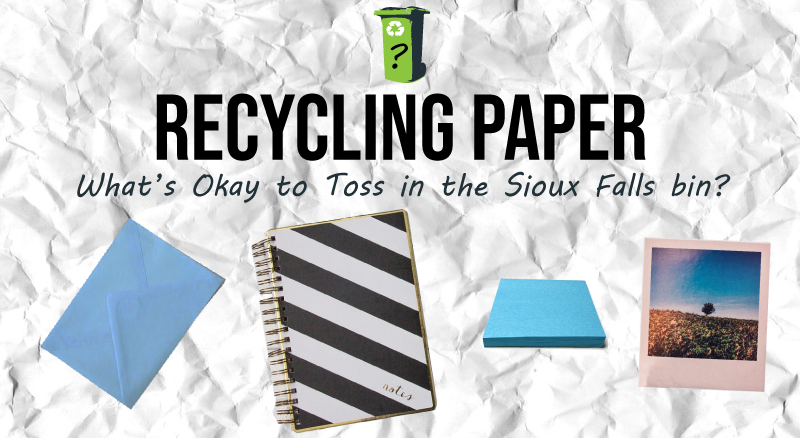 What Types of Paper CAN You Recycle in Sioux Falls? What Types of Paper CANNOT Be Recycled? Spiral or Metal Bindings (Remove these before tossing paper in). Any paper product potentially contaminated with bodily fluids are a No. Check out our handy Where Do I Take This Tool for a complete list of where to take odd items for proper recycling or disposal. If what you’re looking for is not on the list, ask us! We’ll help you find the best disposal option in our area. There are 0 comment. on "What Types of Paper Go in the Bin?"